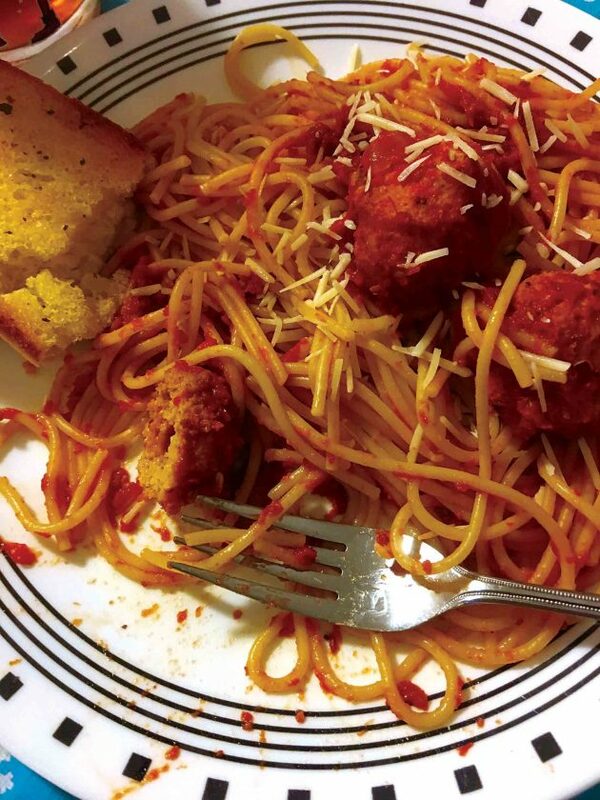 Photo by Amy Phelps Mozzarella Stuffed Chicken Meatballs is served with spaghetti and garlic bread. Get out your slow cooker once again for some easy meals that will make you fall in love with that appliance again with “3-Step Slow Cooker Cookbook” by Drew Maresco. I haven’t used my slow-cooker for a while since my love affair with the Instant Pot began. But when I got this book, I pulled it back out and realized how nice it was once again. Maresco wrote the book to have easy, 3-step recipes that won’t make you have to spend a lot of time with prep work, hover over the slow cooker or dirty up other needless dishes. The book is divided into seven chapters: Fix It and Forget It Comfort Foods, Italian Ora (Hour), Asian at Home, South of the Border, By the Spoonful, Real Easy BBQ and Vegetarian Delights. Fix It and Forget It Comfort Foods include Beef and Rice Stuffed Peppers, Whole “Roasted” Spiced Chicken and Boneless Lemon Pepper Pork Chops. Italian Hour includes recipes for Meatball Marinara Submarine Sandwiches, Italian Sausage Penne Pasta and Chicken Cacciatore with Tomato and Onion. Asian At Home offers recipes for Spicy Chicken Lo Mein, Pork Tenderloin Faux Fry and Pepper Steak with Rice. South of the Border includes recipes for Sirloin Fajitas with Peppers and Onions, Amazing Shredded Chicken Tacos and Pozole-New Mexican-Style Soup. By the Spoonful offers soup and stew recipes like Hearty Beef and Bean Chili, Creamy Italian Sausage, Bean and Kale Soup and Chicken Pot Pie Soup. Real Easy BBQ has recipes for Tender Shredded BBQ Pulled Pork, Dry Rub Beef Brisket and Zesty BBQ Pulled Chicken. Vegetarian Delights offers Mexican Quinoa Stuffed Peppers, Black Bean and Quinoa Enchilada Pie and Mushroom-Loaded Stroganoff. I made Mozzarella Stuffed Chicken Meatballs for dinner one evening, since everyone in our family likes Chicken Parm and Meatballs. The sauce is homemade and the meatballs are made and then sit in the slow cooker for 6 hours, so the only thing you have to do before serving is make the spaghetti. I thought it was really good and tasted reminiscent of Chicken Parm — my kids didn’t agree, they said it was good but just not Chicken Parm. I liked the convenience of the dish and thought it tasted pretty good. I would definitely make it again and want to try other recipes in the book. “3-Step Slow Cooker Cookbook” is published by Page Street Publishing. It is $21.99.